Donnie Betts spent 6 years filming my friend Vincent Harding. He went to the West Bank with the civil rights delegation with which the clip below begins (I roomed with Donnie there). Vincent is an extraordinary figure, a man of great vision about injustice and wisdom. See my essays about him here, here, here, here, here, and here. Donnie has a fine eye and real determination, and wants to get a documentary out on April 4th, the 50th anniversary of Martin Luther King's speech on Vietnam in 1967 (the first draft was written by Vincent) and the 49th of King's assassination in Memphis in 1968. He has created a go fund me page to help him do the last research for this film here. WE are up and running join us. The funds raised will be used to transcribe the film footage that I have collected over course of 6 years. Dr. Harding joined the ancestors in May 2014. My goal is to have the film ready for broadcast to mark the 50 anniversary of Martin Luther King's speech title Beyond Vietnam which Harding was the author. I need your help. I also need to add one addition interview which I have travel to Ohio State and to visit his archives at Emory University in Atlanta. 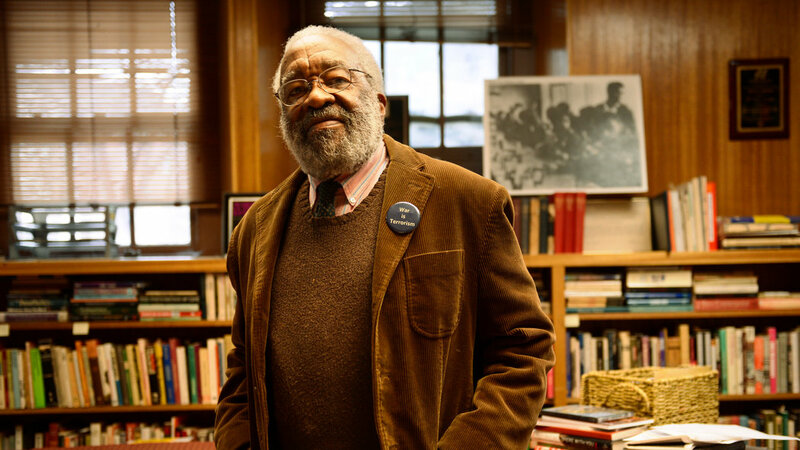 The film focuses on Dr. Vincent Harding, a New York native and a national icon whose work as a writer, speaker, advisor, mentor, historian and institution builder spans 5 plus decades. The film begins with powerful images of Dr. Harding in the West Bank in the Middle East talking and walking in solidity with what he feels are oppressed people today just like Black people he walked with and helped heal their wounds during the Southern Freedom Movement aka Civil Rights Movement. Dr. Vincent Harding worked with his late wife, Rosemarie Freeney Harding in the Southern –based Black freedom movement for peace and justice. Dr. Harding was a senior academic advisor to the award-winning PBS documentary “Eyes on the Prize”, former director of the Martin Luther King, Jr. Center and one of the organizers of the Institute of the Black World the forward thinking acting think tank of the late 1960’s and early 1970’s. Conversations with peers such as Robert Moses, Danny Glover, Angela Davis, Lerone Bennett Jr., Bernice Johnson Reagon and others tie the threads of the Harding’s story together without pretentious scripts or staging. Vincent is an unbelievable storyteller with amazing recall. Moreover, it is Vincent’s willingness to allow the viewer to "feel" his world through his eyes. Harding also shares his personal thoughts about the loss of his first wife and co -creator of the Veterans of Hope, Rosemarie and his love and respect for his mother. We will weave the powerful anti-Vietnam speech that he wrote and delivered by Martin Luther King in and out of our conversation at Riverside Baptist Church where it was delivered in 1967 exactly one year before king’s assassination.